Fifty years ago today — July 10, 1962 — Telstar 1 launched from Cape Canaveral on a Delta rocket. 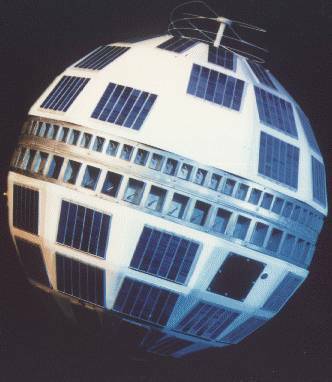 Telstar 1 was built by AT&T Bell Telephone Laboratories, making it the first privately-built communications satellite, and broadcast the first live television signals between the U.S. and Europe. The spacecraft was short-lived — its “command channel began to behave erratically” in November and its transmitter failed in February 1963 — but it proved the concept and thereby led to the worldwide satellite communications we enjoy today. In other space history, on this date 20 years ago, the Giotto probe made a flyby of Comet Grigg-Skjellerup, passing the comet’s nucleus at a distance of between 100-200 km (62-124 mi). It was Giotto’s second flyby, having studied Comet Halley on its primary mission, and the closest-ever flyby of a comet nucleus. 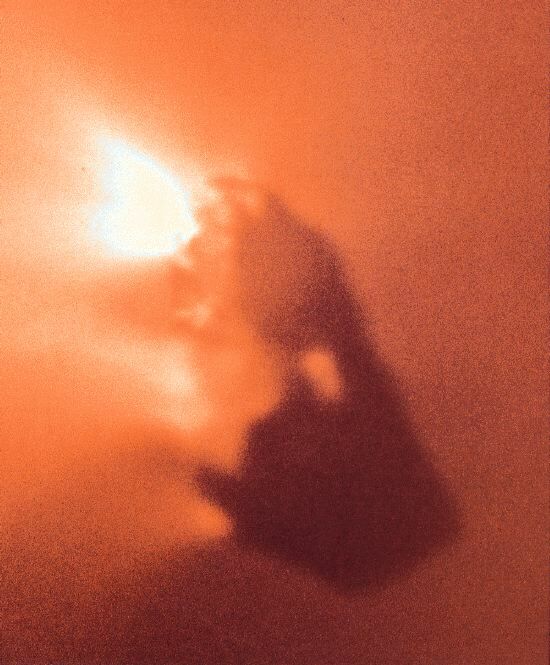 Twenty-five years ago today — March 28, 1986 — the ICE spacecraft flew by Comet Halley. ICE, or the International Cometary Explorer, was originally designed to study the solar wind, and named the International Sun-Earth Explorer-3. It launched on a Delta rocket in August 1978. It was initially placed into an elliptical halo orbit about the Lagrangian libration point (L1) 235 Earth radii on the sunward side of the Earth, where it continuously monitored changes in the near-Earth interplanetary medium. In conjunction with the mother and daughter spacecraft, which had eccentric geocentric orbits, this mission explored the coupling and energy transfer processes between the incident solar wind and the Earth’s magnetosphere. In addition, the heliocentric ISEE 3 spacecraft also provided a near-Earth baseline for making cosmic-ray and other planetary measurements for comparison with corresponding measurements from deep-space probes. 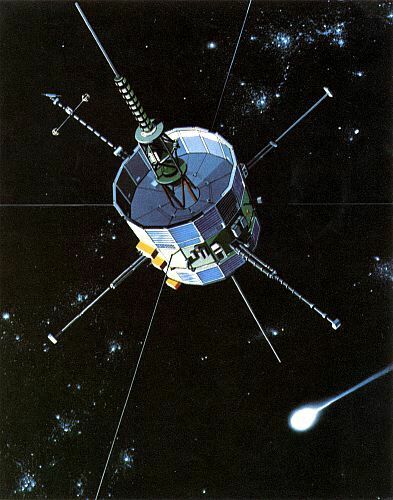 ISEE 3 was the first spacecraft to use the halo orbit. 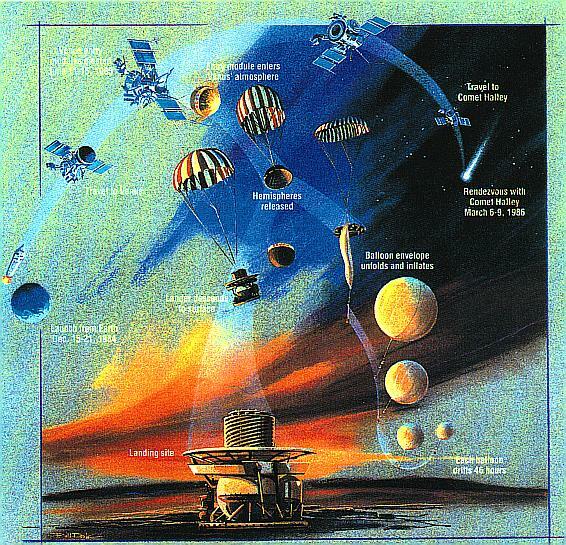 In 1982 ISEE 3 began the magnetotail and comet encounter phases of its mission. A maneuver was conducted on June 10, 1982, to remove the spacecraft from the halo orbit around the L1 point and place it in a transfer orbit involving a series of passages between Earth and the L2 (magnetotail) Lagrangian libration point. After several passes through the Earth’s magnetotail, with gravity assists from lunar flybys in March, April, September and October of 1983, a final close lunar flyby (119.4 km above the moon’s surface) on December 22, 1983, ejected the spacecraft out of the Earth-Moon system and into a heliocentric orbit ahead of the Earth, on a trajectory intercepting that of Comet Giacobini-Zinner. At this time, the spacecraft was renamed International Cometary Explorer (ICE). In addition to being the first spacecraft to orbit a Lagrangian libration point, ICE was also the first spacecraft to fly past a comet. It flew first by Comet Giacobini-Zinner, and later by Comet Halley. Interestingly, in 2014 ICE’s orbit will bring it “close enough to Earth that it could be recaptured if a spacecraft were available.” I wonder if that would make a good story …. 230 years ago today — March 13, 1781 — British astronomer Sir William Herschel discovered the planet Uranus. Herschel discovered Uranus by accident while surveying lesser-magnitude stars. Up until that time, Uranus itself was thought to be a star. This National Air & Space Museum page has more about the discovery of the outer planets of our solar system. On a more recent space history note, 25 years ago today the European Space Agency’s Giotto spacecraft encountered Comet Halley. It was Europe’s first deep space mission, and the first to return close-up images of a comet’s nucleus. Twenty-five years ago today — March 6, 1986 — the Soviet spacecraft Vega-1 made its flyby of Comet Halley. Vega-1 had been launched on December 15, 1984, from the Baikonur Cosmodrome, and first dropped probes onto Venus in June 1985 before continuing to its cometary intercept. Its sister craft, Vega-2, launched six days later and encountered Comet Halley on March 9, 1986. Fifteen years ago today — July 23, 1995 — Comet Hale-Bopp was discovered nearly simultaneously by Alan Hale and Tom Bopp. On the night of July 22-23 — the first clear night here in a week and a half — I had planned to observe two comets. I finished with the first one — Periodic Comet Clark — shortly before midnight, and had about an hour and a half to wait before the second one — Periodic Comet d’Arrest — rose high enough in the east to get a good look at. I decided to pass the time by observing some deep-sky objects in Sagittarius, and when I turned my telescope (a Meade DS-16) to M70, I immediately noticed a fuzzy object in the field that hadn’t been there when I had looked at M70 two weeks earlier. After verifying that I was indeed looking at M70, and not one of the many other globular clusters in that part of the sky, I checked the various deep-sky catalogues, then ran the comet-identification program at the IAU Central Bureau’s computer in Cambridge, Massachusetts. I sent an email to … the Central Bureau at that time informing them of a possible comet; later, when I had verified that the object had moved against the background stars, I sent them an additional email. I continued to follow the comet for a total of about 3 hours, until it set behind trees in the southwest, and then was able to email a detailed report, complete with two positions. 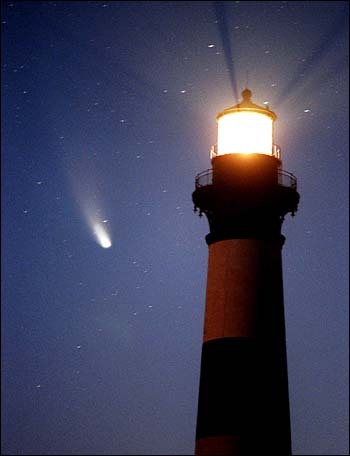 While Hale was observing the comet from his New Mexico location, Bopp also saw the comet from just south of Phoenix, Arizona. When the International Astronomical Union announced the discovery of the new comet, it carried both men’s names. 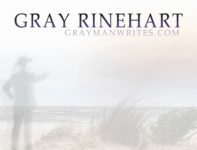 Hale’s blog hasn’t been updated in awhile, but it’s available here as part of the Cosmic Diary. Comet Hale-Bopp, of course, is also remembered as the catalyst for the multiple suicides of members of the “Heaven’s Gate” cult. I prefer to give its discovery a more prominent place than that later unfortunate episode. *And not the Skipper on Gilligan’s Island. Twenty-five years ago today — July 2, 1985 — the European Space Agency launched the Giotto spacecraft on an Ariane-1 booster out of French Guiana. Giotto was the ESA’s first deep space mission, launched to study Comet Halley (which I grew up calling Halley’s Comet, but somewhere along the line the naming convention seems to have changed). Giotto rendezvoused with Comet Halley in March 1986 and passed within 600 km (c. 370 mi) of the comet’s nucleus. The spacecraft was not expected to survive its encounter, and cometary dust did damage it, but the probe and most of its instruments continued to function. As a result, the ESA extended the Giotto mission to rendezvous with comet Grigg-Skjellerup, making Giotto the first spacecraft to rendezvous with two comets. More images from the Giotto mission are available on this ESA page. 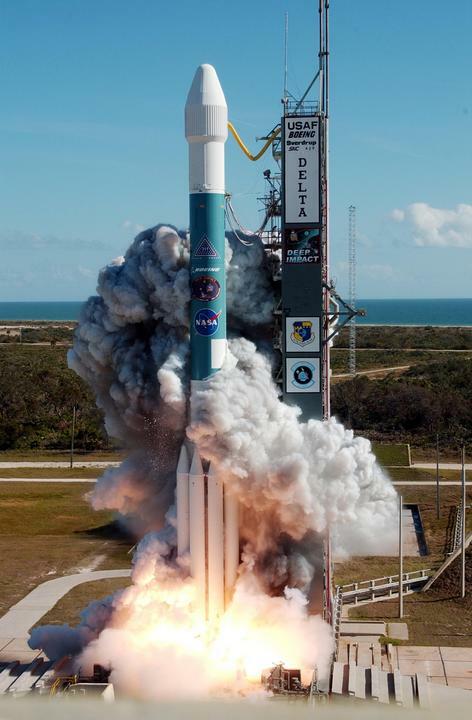 Five years ago today — January 12, 2005 — the Deep Impact probe launched atop a Delta 2 rocket from Cape Canaveral, on its way to a rendezvous with comet Tempel 1. Twenty-five years ago today — January 7, 1985* — an M-3SII launch vehicle took off from Japan’s Uchinoura (formerly Kagoshima) Space Center carrying the Sakigake spacecraft toward Halley’s Comet. Sakigake means “pioneer,” and this spacecraft was actually a pathfinder for the Suisei spacecraft launched eight months later. Sakigake’s main role was to provide a distant reference point to help scientists interpret data sent from probes that flew much closer to the nucleus of the comet. Sakigake’s closest approach to comet Halley was 7 million km (about 4.4 million miles). Additional comet encounters were planned for the Sakigake spacecraft, but it depleted its hydrazine propellant and finally telemetry from the vehicle was lost in November 1995. *For us here in the U.S.; it was already January 8th in Japan.